Sponsored by Kroger's grocery chain, Hearts in Harmony was a popular daytime soap opera in the 1940s and 50s. Hearts in Harmony features the story of a poor young composer, Steve Parker, who is trying to make his mark on the music world. He meets a beautiful singer named Penny from a wealthy family. Their worlds collide in this dramatic soap opera serial. 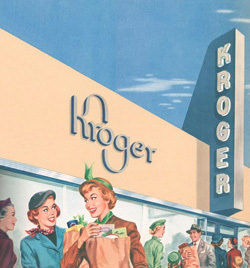 The shows features commercials about products from Kroger. In one commercial for Kroger Beef, the announcer says that there is a shortage of beef due to world hunger and a grain shortage. For other popular soaps, see also: Vic and Sade, Guiding Light, One Mans Family, Eternal Light, Ma Perkins and Mary Noble Backstage Wife. Hearts in Harmony is frickin' amazing. I bought and listened to the entire thing once a day, M-F, for almost 2 years. I enjoyed it so much that I started back over at the beginning and am listening to it again! Super interesting that they drop the singing about six months into what's available. I missed that but the show is still enjoyable without it. The voice actors are really great and are all distinct (a problem I've had with other radio serials is that characters sound too much alike) - Penny and Freddy are my faves. I sooooooooooo wish I could hear the entire series but at least the series comes to a reasonable "ending."